The Instructor's Manual provides teaching suggestions and an answer key for the Student's Book. 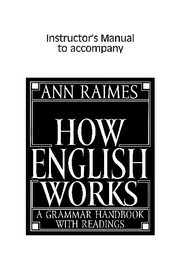 How English Works provides a user-friendly presentation of the basic problems in English grammar for writing students. A flexible format allows teachers to adapt the text to a variety of course requirements. Clear presentations, including boxes, charts, and tables, serve to clarify grammatical structures and make them accessible to learners.